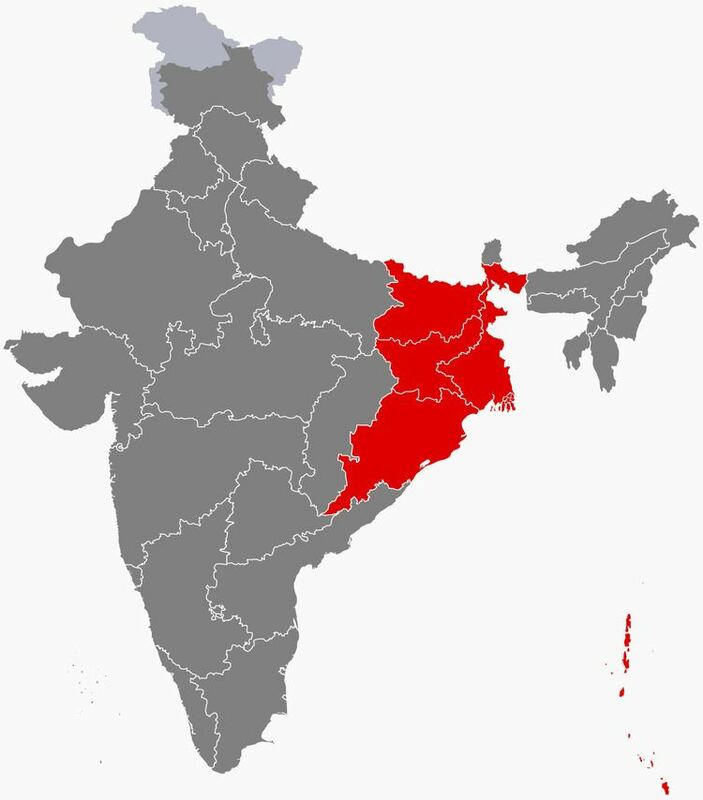 East India is a region of India consisting of the Indian states of Bihar, Jharkhand, West Bengal, Odisha and also the union territory Andaman and Nicobar Islands. West Bengal's capital Kolkata is the largest city of this region. The Kolkata Metropolitan Area is the country's third largest. The states of Odisha and West Bengal share some cultural and linguistic characteristics with Bangladesh. Odisha is the only state of India, which has a classical language Odia, a classical dance Odissi and a classical music Odissi music. Bengali is the most spoken language of this region and it is also the second most spoken language in India after Hindi. Odia is the only language in east India accorded the status of a Classical Language of India. Together with Bangladesh, West Bengal formed the ethno-linguistic region of Bengal before partition in 1947. The modern state of Odisha was known as Kalinga, Odra desha and Utkala in ancient times. It was ruled by indigenous rulers of the Mahameghavahana dynasty, Eastern Ganga dynasty and Gajapati Dynasty. The Kolkata metropolitan area is spread over 1,886.67 km2 (728.45 sq mi) and comprises 3 municipal corporations (including Kolkata Municipal Corporation), 39 local municipalities and 24 panchayat samitis, as of 2011. The urban agglomeration encompassed 72 cities and 527 towns and villages, as of 2006. Suburban areas in the Kolkata metropolitan area incorporate parts of the following districts: North 24 Parganas, South 24 Parganas, Howrah, Hooghly, and Nadia. Kolkata, which is under the jurisdiction of the Kolkata Municipal Corporation ( KMC), has an area of 185 km2 (71 sq mi). The east–west dimension of the city is comparatively narrow, stretching from the Hooghly River in the west to roughly the Eastern Metropolitan Bypass in the east—a span of 9–10 km (5.6–6.2 mi). The north–south distance is greater, and its axis is used to section the city into North, Central, and South Kolkata. North Kolkata is the oldest part of the city. Characterised by 19th-century architecture and narrow alleyways, it includes areas such as Shyambazar, Shobhabazar, Chitpur, Cossipore, Sinthee, and Dum Dum. The north sub urban areas like Baranagar, Belghoria, Sodepur, Khardah up to Barrackpur are also within the city of Kolkata (as a metropolitan structure). Bhubaneswar is the capital of the Odisha. Other Important Cities are Cuttack, Brahmapur, Rourkela , Sambalpur and Puri.The Capital city has a long history of over 2000 years starting with Chedi dynasty (around the 2nd century BCE) who had Sisupalgarh near present-day Bhubaneswar as their capital. Historically, Bhubaneswar has been known by different names such as Toshali, Kalinga Nagari, Nagar Kalinga, Ekamra Kanan, Ekamra Kshetra and Mandira Malini Nagari (city of temples) or the temple city of India. The largest city of Odisha, Bhubaneswar today is a center of economic and religious importance in the region. With the economic liberalisation policy adopted by the Government of India in the '90s, Bhubaneswar received large investments in the fields of telecommunications, IT and higher education, particularly in science and engineering. The city is home to around 60 engineering colleges (as of 2009) and the number is growing every year. The city is also home to many tutorials and coaching institutes who prepare students for various entrance exams. Bengali is the dominant language of West Bengal . Hindi along with Urdu, Maithili, Magahi and Bhojpuri is the dominant language of Bihar and Jharkhand. Also, Santhali and Magahi are the dominant language of Jharkhand, however 34% people of Jharkhand are tribals (2001 Census) and speak their own tribal languages. However Jharkhand government declared Odia as the 2nd official language. Odia is the dominant language of Odisha . Odia is the only classical language in east India and first Indo-Aryan language-family and sixth Indian language to be considered as a classical language in the basis of being old and not borrowed from other languages. The Indo-Aryan languages spoken in this region descend from the Magadhi Prakrit, which was spoken in the ancient kingdom of Magadha. Odia emerged as a distinct language from Magadhi Prakrit and Maithili emerged around the 9th century CE. Kolkata Port, Haldia and Paradip Port is three mejor port in East India.Kulpi Port, Gopalpur Port, Dharma Port is minor port in east India.